Various ‎– The Best Club Anthems III...Ever! Licensed From – Zomba Recording Company Ltd. Licensed From – ZTT Records Ltd. 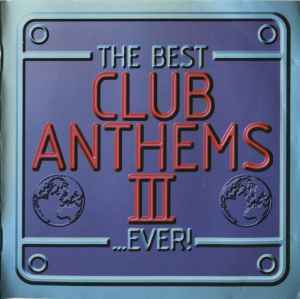 Licensed From – Circa Records Ltd.
cover: "The Best Club Anthems III...Ever!" spine: "The Best Club Anthems... Ever! III"
back cover: "The Greatest Club Mix Of All Time" / "Over 2½ Hours Of Classic Club Mix"
This compilation ℗ and © 1998 Circa Records Ltd. This compilation ℗ and © 1997 Circa Records Ltd. This is the third volume of the famous and popular 'Best Club Anthems' series released in May 1998, and Richard Evans was the DJ mix once again. I found this one to be an improvement over the previous two releases personally, because this one is very unique in it's variety of tracks and has a lot of energy throughout. Looking at disc one, when I put this on for the first time and listened to every song, I was just amazed to the point of being blown away. Practically every song on here was superb, and some towards the end were literally masterpieces. Looking back at it, the first disc gives us Bamboo's The Strutt, Tamperer's Feel It (mixed to perfection), Run DMC's It's Like That, the one and only Ti Tin Out's This Is Where The Story Ends (Canny Remix), Camisra's Let Me Show You (Tall Paul Remix), Sash! 's La Primavera (another one of their beauties), Subliminal Cuts's Le Voie Le Soleil, B.B.E. 's Deeper Love (Symphonic Paradise) (Club Mix), 808 State's Pacific State 808 : '98, an appearance by The Prodigy and the rare but 'perfect' 'Teardrops' by Massive Attack. Need I say more? The mixing is mind-blowing, and every single inclusion deserves to be on here! Disc two was also fantastic! The fantastic songs definitely outweighed any negative aspects, and these so-called good hits were: Cornershop's Brimful Of Asha, Wildchild's Renegade Master '98 (Fatboy Slim Old Skool Mix), The Bucketheads's The Bomb (These Sounds Fall Into My Mind) (Radio Edit) and the last five tracks on the CD. The last five were mixed to glory and perfection, and they were all mind-blowing. It was especially good to see Alexia, Da Hool, Rest Assured and UBM on there. So while there were definitely 'less' memorable hits, it is still a mighty fine listening experience, no doubt. Club Anthems III is one of the best in the series, only inferior to The Best Club Anthems 99... Ever!